There are lots of games, apps, and other tools kids and teens can use to learn coding, but a new option, LOMO, wants to help young children learn to code without any required screen-time. 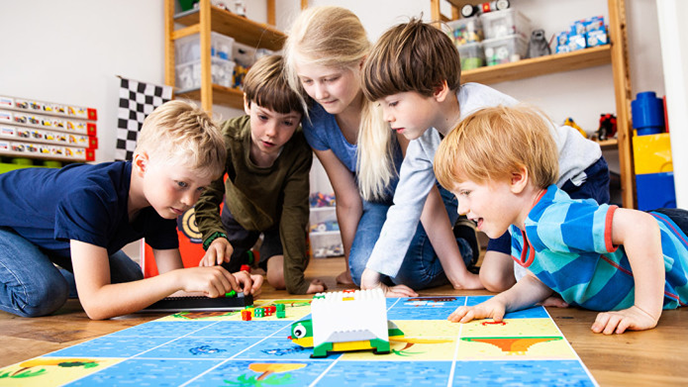 LOMO combines a programming board with coding bricks and a robot that looks like a turtle to teach kids as young as four the basics of coding. Coding bricks look like Legos, and they come in four different colors: green, yellow, red, and white. Each color corresponds to a different action the robot can take, like turning to the left or right, or moving forward. Kids can attach these bricks to the programming board to create a series of actions for the robot to take. When they’re done adding bricks, they can activate them to see the bricks light up as the robot completes each command. LOMO comes with 25 cards that can be arranged on the floor in different ways to create a tropical adventure map for the turtle to navigate. A set of playing cards also provides prompts for short tasks kids can complete. For instance, one card asks kids to lead the robot to a cartoon turtle on one of the map’s cards. When kids are done coding, they can can customize their robot using the Legos or other building bricks they may have lying around the house. LOMO is expected to launch in December 2018, and it’s currently looking for funding on Indiegogo. Indiegogo is a crowdfunding website that allows users to pledge money to a project to help it come to life. The LOMO Starter Kit is priced at $99 (or $89 for early supporters on Indiegogo).